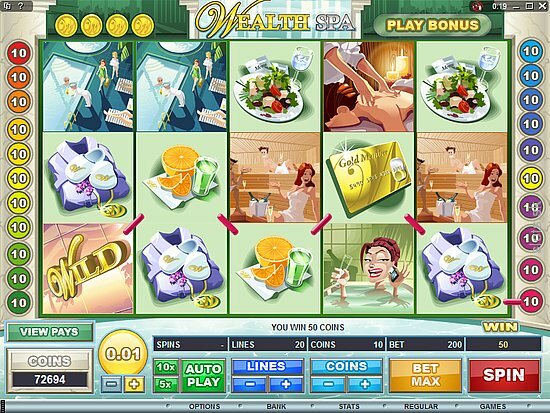 The Wealth Spa Slot Game is a game with a difference and with some rather interesting and fun variations to satisfy both low rollers and high rollers alike. The game is designed to be like a spa facility and so it follows that the symbols will be in keeping with that theme. Therefore, symbols include the reception area, a bath tub, massage, swimming pool and a sauna. What becomes immediately noticeable is the fact that the symbols are really well designed and they even boast fantastic animation as well. The reception symbol, for example, depicts a rather rotund woman and her pooch. The bath symbol is another fun animation. Here we see a woman sipping on a glass of champagne while she relaxes in the bath and engages in a conversation on her mobile phone. The Wild symbol is the Wealth Spa logo and the Scatter symbol is, rather appropriately, a gold card. As might be expected, the background music in this game is also in keeping with the spa them since is is both relaxing and pleasant. This particular online casino slot game does not boast a progressive jackpot, which is obviously a drawback for some slot players. However, despite the lack of a progressive jackpot, Wealth Spa has much to recommend it, not least of all the rather impressive fixed jackpots that are available. When the Wild symbol, the Wealth Spa logo, turns up on the reels, players can win a maximum of 5,000 coins. The Bath symbol pays somewhat less – 2,000 coins. What cannot be denied, however, is the fact that Wealth Spa also provides a rather unique set of Bonus rounds for players to enjoy and to help secure bigger payouts. With twenty paylines available and three coin denominations, Wealth Spa is a great game even for low rollers. The manner in which the Bonus rounds are triggered is somewhat unique to the Wealth Spa video slot game in that they are triggered by the number of tokens a player has collected and then exchanged. Each time the player spins the reels, they collect tokens. These can then be exchanged for one of no fewer than five available Bonus rounds. Tokens are shown on the fifth reel and, if they turn up on the top or the bottom rows, the double payouts. There is a limit on the number of tokens that can be collected however, as players may only accumulate five of them before they must be exchanged for one of the Bonus rounds. As mentioned above, there are five Bonus rounds available, namely the Smoothie, Hot Stones, Body Wax, Bath Oil, and the Massage Bonus rounds. The Smoothie Bonus round will cost the player only one token. They player has to choose four fruits in order to make a smoothie. They are awarded bonus credits depending upon the choices they made. The Hot Stones Bonus round costs two tokens. Here, the player is presented with five stones. They must then select two to reveal their surprise payout multiplier. The Body Wax Bonus round is available for three tokens. This is quite a fun Bonus round because the player has to remove plasters from others at the spa. The payout they receive is dependent upon the screams of pain they can solicit when removing the plasters. Four tokens will buy the Bath Oil Bonus round and for five tokens, the player can access the best of the five Bonus rounds, the Massage Bonus. In this Bonus round, the player can collect free spins which they can then play. In the Free Spins round the player can win a maximum payout of 200,000 coins. Although Wealth Spa does not have a progressive jackpot, which many slot players look for, the great fixed jackpots, the five Bonus games, the interesting and fun game play, and the great graphics and animations more than make up for it.